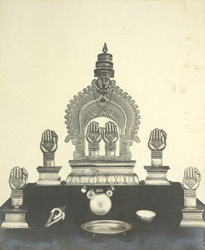 Photograph of an arrangement of religious objects from the Bhagavati Temple, at Agattaitara in the Palakkad (Palghat) district of Kerala, taken by a photographer of the Archaeological Survey of India on the 1st February 1901. In the second volume of his work 'Malabar' of 1887, William Logan wrote, "Kallekkulam alias Emur Bhagavathi temple - In Akathethara amsam. Dedicated to Jaladurgha. the roof of the Srikovil is covered with copper sheeting. the other portions are tiled. the temple is 132 x 114 in extent." The objects are symbols of the Devi or mother goddess cult, the metal hands are representations of one of the most popular deities of Kerala, Bhagavati, to whom numerous temples are dedicated. The hands denote a legend pertaining to the goddess. In the form of Hemambika she was worshipped in a remote valley shrine which was accessed by an arduous trek through dangerous forests. One day, overhearing a group of aged Brahmins regretting their inability to make the trek to worship her, she appeared to them as a pair of luminous hands in the middle of a lake. They tried to clasp these hands which turned to stone. The Brahmins erected a shrine around the hands and thereafter silver hands raised in blessing came to represent the goddess. The hands are set in a miniature golden shrine or vimana which is topped with a tiered umbrella, the symbol of royalty. Placed beneath is a metal plate for offerings and a conch shell or shankha which acts as a trumpet to make the auspicious sound to awaken consciousness. Just below the shrine are suspended discs representing the all-seeing eyes of the goddess.